Jane Feather unveils her new beautiful cover! 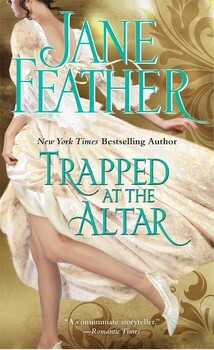 Jane Feather, New York Times bestselling author of The Blackwater Bride series, Twelfth Night Secrets, and Engagement at Beaufort Hall, reveals her delightfully gorgeous new cover for TRAPPED AT THE ALTAR. Check it below and be sure to pre-order this fab new book in her brand new series which publishes in July 2014!